Now in its 30th year, the Pathfinder becomes more appealing for 2017 with a significant freshening that grants it more power and safety features like automatic emergency braking. As a 3-row midsize SUV, the Pathfinder competes well against the Honda Pilot, Toyota Highlander and Chevrolet Traverse, but at seven passengers max it holds one less than those rivals. The seat are very comfortable on long drives. Overall I really like the car. It drives very well and I like the reliability, it has not had any major performance issues. however I have had a few strange electrical issues. From time to time when I put the windows down they will not go back up and I have to turn the car off and back on to get them to work also when I back up and switch into drive the backup camera does not switch off so it continues to run on the dash screen and again I have to turn the car on and off to fix the problem. Because they are intermittent issues the dealership has not been able to catch and therefore fix the problem. Overall it does not affect the way the car runs or my ability to use the car so it is not a big deal. I like this car quite a bit. The price is excellent consider the features that are comparable to many of the other three row SUVs. My Nissan Pathfinder is an excellent SUV, especially for those who find value in having a third row (or at least the extra space a third row provides). It's one of the more reasonably priced third row SUVs, but has the same safety and luxury features as the others. It is roomy, the seats are comfortable, and the features (like the movable second row) make accessing the third row (with two car seats in the second) a breeze. You can actually fold and move the second row with car seats installed - no other bench row SUV I researched had this capability. All in all, I love this SUV and am very happy with my purchase. It is dependable and reliable. The vehicle is spacious and perfect for a family. It has 3 rows, 7 seats and roomy trunk space. My kids love the comfort of the vehicle. It has backup camera and sensors which I absolutely love. There are climate controls for all 3 rows in the car so no worries about the air circulation not reaching the back passengers. This is a perfect family vehicle. We have comfortably used this vehicle for a road trip recently and we all loved how safe and comfortable it was. My vehicle also has a remote start feature which is perfect for cooling down the car or heating it up before we get in. 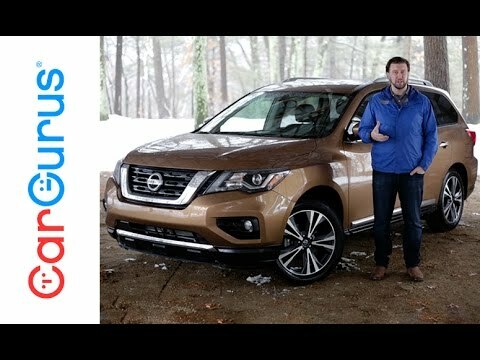 2017 Nissan Pathfinder First Drive Review - In 4K UHD!